Austin Green, a shipper, signed up in Toronto on this day in 1916. He was born on April 21st, 1897, the son of Daniel Green, a Mohawk, and Susan (née Minnie). The family were living in Deseronto at the time of the 1901 census and in Belleville in 1911. When he enlisted in 1916, the family’s address was 3 Lakeview Avenue, Toronto. Green joined the 180th Battalion with the regimental number 862396. He was five feet five and a quarter inches tall, with a medium complexion, blue eyes and dark brown hair. Austin Green’s service record tells us that he arrived in England on November 20th, 1916 and was transferred to the 123rd Battalion. 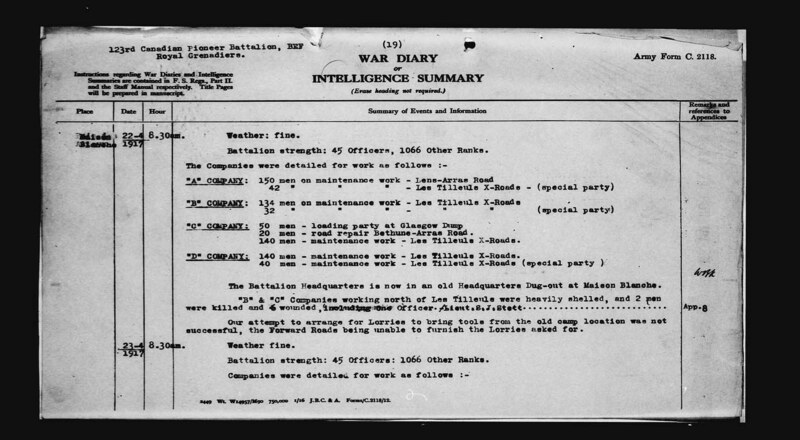 He was one of six men wounded on April 22nd 1917 while working on road maintenance with this unit (war diary entry). After recovering in England, Green was transferred to the 4th Battalion in April 1918. He did not come home.